The Focus RS and Mustang EcoBoost engine has a weak point and many customers that have pushed the car to the limits have found the issue with the stock pistons. For all customers wishing to push the car to the limit the piston and rod upgrade are essential. We now have in stock Wossner forged pistons and PEC Steel con rods for the new Ford Focus RS & Mustang 2.3 Turbo. The pistons have been based around OEM samples supplied by Ford Performance and tweaked to make them more suitable for aftermarket tuning. The main change is the slight drop in compression ratio over OEM pistons. The 2.3 engine uses Ford’s Eco-Boost direct injection system which makes changes to the compression ratio difficult. Too high will result in detonation and the subsequent “dialling back” of the ignition advance dulling performance, and too low will end up with poor fuel economy and emissions unable to pass yearly checks. We have listened to the feedback from a number of sources regarding our existing 2.0, 1.6 and 1.0 Ecoboost pistons and decided to lower the C/R on these pistons from the OEM 9.3:1 to 9.0:1. A minor drop but should provide a useable C/R for tuning without the adverse effects mentioned above. 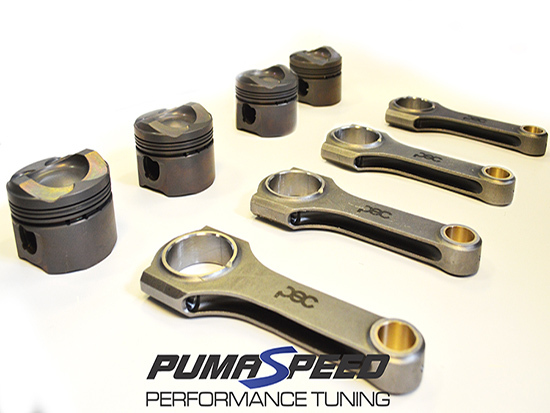 As far as fitment is concerned, both the pistons and the connecting rods are interchangeable with OEM parts so customers who want to retain OE rods but require pistons can do so. Of course we are able to offer the traditional “Piston and rod” package, while the con rods come supplied with the traditional ARP 2000 series fastener or the optional 625 custom age fastener. WOSSNER rods are designed to withstand roughly 225hp per cylinder (typically 900hp on most 4cyl engines) and on the ARP 2000 series 3/8 bolts normally provided & have an 8,500 RPM safe operating limit (engine specific). In some cases, we recommend using the ARP custom age bolts available from us. This increases the hp threshold to 250hp per cylinder and raises the RPM limit to 9,000 however as every engine is different, these numbers are not guaranteed for every configuration. The Pumaspeed Workshop team are ready to fit the WOSSNER 2.3 Ecoboost Uprated Forged Pistons and Rods in our Head Office located here. We estimate the labour time to be approximately 16.00 hour(s) costing £1,248.00 inc VAT. Therefore making parts and labour a total cost £2,377.00 (inc. VAT). Pumaspeed have a specialist distribution team that can dispatch the WOSSNER 2.3 Ecoboost Uprated Forged Pistons and Rods to any destination worldwide.